DETROIT, Michigan (CNN) -- It's 7 a.m. at Henry Ford Hospital, and surgeons are preparing to remove a cancerous tumor from a man's kidney. 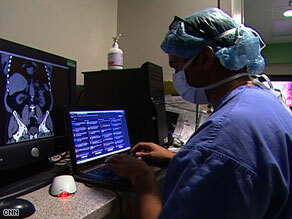 A doctor posts updates on social-networking site Twitter during a recent operation in Detroit. It's potentially a risky surgery, but everything's ready: The doctors and nurses are in the operating room, the surgical instruments are sterilized and ready to go, and the chief resident is furiously Twittering on his laptop. That's right -- last week, for the second known time, surgeons Twittered a surgery by using social-networking site Twitter to give short real-time updates about the procedure. "Here's something different: HenryFordNews is live tweeting surgery today, getting some buzz, too," wrote one Twitter participant from Massachusetts. "I find this fascinating!" tweeted another Twitter user from Swansea, United Kingdom. Who will be masters of the 'Twitterverse'? "It's an interesting use of technology, but I can't help but feel a bit 'eeewww!' about this," wrote a third tweeter from New York. Whether it's new and cool or merely yicky, observers say there's no question that more and more doctors -- and patients -- will be sharing the blow-by-blow of medical procedures on sites like Twitter and Facebook. "We're trying to use this as a way to get the word out," Rogers said. "Doing this removes a real communication barrier. It helps make something scary much more comprehendable," said Christopher Parks, co-founder of the Web site changehealthcare.com. "It brings us closer together and makes us more engaged." Four months ago, Park's colleague, Robert Hendrick, tweeted his own varicose vein removal surgery here as it was happening (he was, obviously, under local anesthesia). "It redirected my attention and allowed me to minimize some of the nervousness around what was going on. It felt like I had family and friends there to support me," Hendrick wrote in an e-mail. "I wanted a record for other people who might be interested in the same surgery," added Hendrick, who also posted photos and video of his surgery. "It later allowed me to connect with others with the same issues." As time goes by and the younger generation moves into medicine, expect even more sharing online of private medical procedures, Parks says. "Newer and newer generations are used to putting their life online," he said. "This generation shares everything." Twitter users -- those "tweeple" -- who kept up with the Henry Ford procedure online got to share some medical drama in real time. (You can read the "Tweetstream" or watch video of the tumor removal on YouTube). As Rogers got closer to the tumor, he realized it was far larger than it had appeared on a CT scan, and he wondered out loud whether he would have to remove the entire kidney -- something he'd been trying to avoid. "Gosh, this is big," he said to his colleagues in the operating room. "Could I have picked a harder case for this?" As Rogers worked away on his robotic machinery, the chief resident, Dr. Raj Laungani, Twittered: "Dr. Rogers is saying because the tumor is so large he may have to do a radical (total) nephrectomy." After conferring with Laungani and others in the operating room, Rogers decided he could remove just part of the kidney. Then came another challenge: In a surgery like this one, doctors have to restrict blood flow to the kidney with clamps while they remove the tumor. Those clamps then have to be removed within 30 minutes so the kidney isn't damaged by the lack of blood. iReport.com: Would you allow your surgeon to "tweet"? "The goal is to keep the clamp time below 30 minutes," Laungani Twittered. "25 minutes left!!!" Approximately 25 minutes later, Laungani shared his relief with all of Twitterville: "Tumor is excised, bleeding is controlled, we are about to come off clamp," he wrote. In the end, Rogers had the last tweet. "The robotic partial nephrectomy was a success," he wrote. "Thank you for joining us today." CNN's Jennifer Pifer-Bixler and Marcy Heard contributed to this article. All About Medicine • Twitter Inc.